Photos courtesy of DODOcase Inc.
You might not expect to see techies carrying around old world-style leather journals. But one San Francisco startup is making the look trendy again -- and is helping to revive at least one floundering business in the process. DODOcase Inc. produces an Apple iPad case of the same name (after the extinct Dodo bird) that looks like a classic leather-bound journal. It has a classic look because DODOcase partners with a traditional bookbinding company that saw its business contract significantly during the evolution of the publishing market. 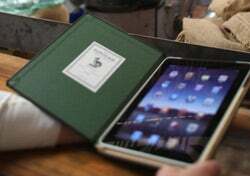 The result is a hand-crafted case made with faux leather, a cloth liner and an eco-friendly bamboo tray. DODOcase co-founder Patrick Buckley, a 29-year-old serial entrepreneur, felt there was a niche among people nostalgic for the warm, classy feel of a traditional book. Buckley teamed up with co-founder Craig Dalton, 40, who Buckley met while training for the Ironman Canada long-distance triathlon in 2005. "There's this attachment people have to books that we were trying to tap into," Buckley says. "The iPad cases that other companies were creating were really utilitarian in nature." The iPad case, priced starting at $59.95, has enjoyed success since its launch in April 2010 -- the same day Apple released its widely anticipated PC tablet. Sales of the DODOcase were slow in the first month but grew to more than 20,000 by late summer. With six employees, the company is on track to meet its goal of generating $3 million to $5 million in its first year, the founders say. Developing their case in only a matter of weeks after Apple CEO Steve Jobs unveiled the iPad concept to the public, Buckley and Dalton learned some valuable lessons that any entrepreneur can put to use when getting a business up and running. No.1: Enlist the right business partner. Having to turn around a prototype on-the-fly, Buckley went to work interviewing the few remaining book binders in San Francisco in hopes of using old-school book-binding techniques. He eventually selected Gabi Hanoun, a master bookbinder who owns a company called Cardoza-James Binding. "Gabi was flexible with payment and all of these things that help when you're just getting started," says Buckley. Hanoun's business has improved since working with DODOcase. Cardoza-James, which employed up to 75 people in its heyday of the 1980s, had only a few workers early last year. The company now employs up to 15 people at a time to help create DODOcase bindings. No. 2: Use unique marketing strategies to create buzz. To get the word out about their new product, the pair recruited people in 10 U.S. cities through Craigslist to hand out flyers, with coupon codes for the DODOcase, to the lines of people waiting outside Apple stores on the iPad's release day. Recruits earned a $10 commission on every sale stemming from the coupons they handed out. Sales of the DODOcase were slow in the first several weeks with only a 100 or so orders coming in from the original coupons. However, it wasn't long before columnists from popular tech blogs like Engadget and the Unofficial Apple Weblog purchased DODOcases and raved about them online. "We probably had about 3,000 orders in early May," Dalton says. "They were a springboard to a lot of other blogs and magazines covering us." No. 3: Manage customer expectations. In order to finish the DODOcase's design, Buckley and Dalton first needed to know the iPad's final specifications. Filling orders in the first few months took four to six weeks. To manage the long wait times, DODOcase used social media sites such as Twitter to generate buzz about their product and to explain the manufacturing process to customers. "We needed to do what we could to keep the excitement level high," Dalton says. No. 4: Turn customers into evangelists. Leveraging social media, DODOcase was able to generate more publicity by interacting with customers and relying on viral marketing. Customers tweeted about the excitement of receiving their Dodocase in the mail. Buckley and Dalton retweeted and responded. DODOcase also received hype when actress Hilary Swank was pictured in the New York Post's Page Six gossip page looking at a DODOcase. 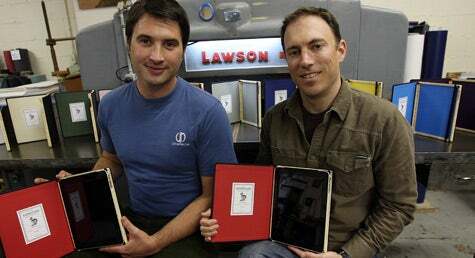 Buckley and Dalton recently began expanding their market by making DODOcases for Amazon's Kindle e-reader. They also intend to introduce cases for other devices and plan to allow for more customization, such as offering foil-stamped inscriptions and an assortment of interior fabrics and designs. The cases also have begun selling at specialty bricks-and-mortar shops. "The challenge for DODOcase is going to be finding new sales and distribution channels to reach those customers who would love our product but just haven't become aware of us yet," Dalton adds.